Steve & Rachel Are Going To France (Recommendations Welcome!) « I'd rather be in France. Steve and I are officially heading to France at the end of the month for two weeks! On our agenda so far are the French Open and lots of driving. If you have suggestions about where we should go, what we should eat, what we should drink, where we should stay, etc., please share in the comments! Also, if anyone knows how to get tickets to the French Open, please let us know. This entry was posted on May 6th, 2011 at 12:47 pm and is filed under Travel, What's this all about?. You can follow any responses to this entry through the RSS 2.0 feed. You can leave a response, or trackback from your own site. I would say go to Rouen, it is about one hour west of Paris. Eat at La Couronne and have the Sole Meuniere. This was the historic restaurant…and dish…that made Julia Child fall in love with French Cuisine. The restaurant is still open today. Maybe more like an hour and a half west…but still would be worth it! Je sais tu ne vas pas partout mais ce sont quelques idées! Paul de Vence & Monaco are both near Nice and are pretty much must sees. I lived in Nice for 3 months. Vieux Nice is the old part on the Mediterranean. You have to eat at one of the outdoor cafes, lay on the stone beach, get a beignets and coffee on the stone beach, and check out the high peak park/cemetery overlooking the Mediterranean and great views of Nice. My recommendation is to take me with you :) I can be your servant boy; you know carry your luggage, scout out brunch places while you guys sleep in, grab alka-seltzer for you, be your personal shopper. Think about it! A lovely picnic at the Pont du Gard? So jealous. Eat bread, cheese and drink fine wine, and make sure there is lots of it. YUM. A picnic at Pont du Gard is an excellent idea. Visiting the Roman theater in Orange is also well worth it and it’s not too far from Arles and that area. If you go to Arles, check out Les Alyscamps. Last May when Marc and I were in the South of France, one of my favorite things that we did was to ride horses in the Camargue which is a beautiful and very unique salt marsh. It’s a doable drive from Arles as well. We rode with Domaine de la Palissade. The number is 06 87 84 33 72. If you make it over towards Marseilles, I highly recommend shooting over to the fishing town of Cassis and taking a boat ride through the magnificent Calanques. You can also hike the Calanques. Check out my France pics on Facebook if you get the chance. I thoroughly enjoyed everything that we did that trip. Have a great time! Go to Mont Marte… there is an adorable courtyard (artist square) and great food… it is off the beaten but a short cab ride from the Louvre… also call me crazy but eat a hot dog they are unlike any other!!!! 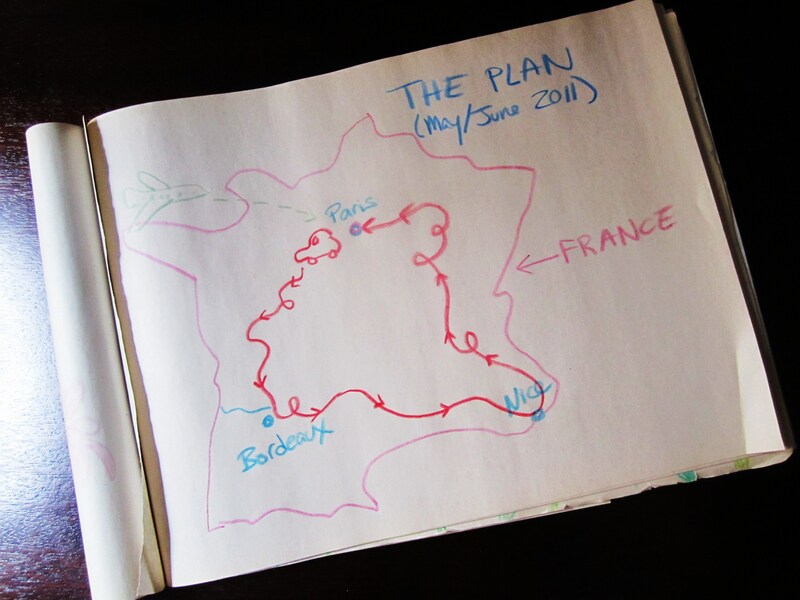 I have never been to Paris, but after reading your blog, a two week trip to France is moving to the top of my “To Do List”. Julia Child’s scrambled eggs are the best, yet so divinely simple. The photos of the French onion soup are so enticing. You could come visit us here in Moux. We are a tiny wine village in the Corbieres area – South of France. Then you could try all the local food – how about Salad Nicoise, Cassoulet, the most fantastic French bread ever, stunning local food markets and La Cite – the ancient 11th century city of Carcassonne. And you know someone who lives down here!